Plan the most romantic surprise for your loved one!! Dinner at Marina Dhow Cruise will add living romance memories to your tour of Dubai. Dip yourself in to unlimited romance we offer at Dhow Cruise Marina. The high standard food at beautiful cruise at the verge of the sea under the light of marina high roof buildings. Don’t miss the chance to collect moonlight memories that will shine to cherish you forever and make your Dubai trip a life time memorable. Dubai marina is one of the manmade wonders of the world and worth watching through dhow cruise while enjoying dinner and dance shows. 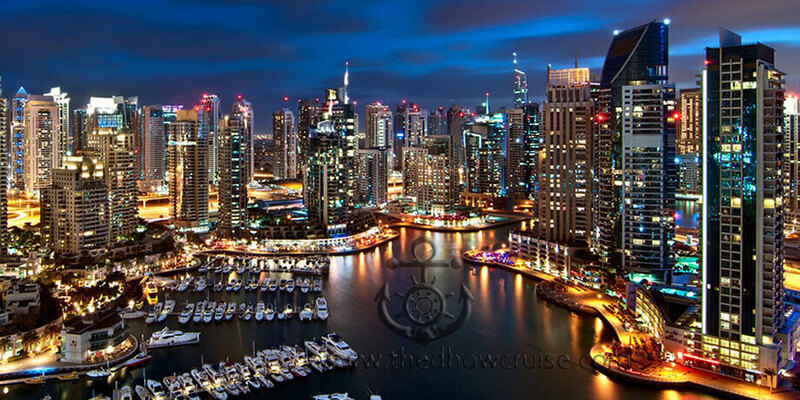 During the trip you will sail through the spectacular skyline of Dubai Marina. The tall standing buildings surrounding the marina whose reflection in the water merging with the lid Dhow Cruise marina creates a beautiful environment. We also offer Belly Dance show with 5* buffet dinner and drinks on our Marina Dhow Cruise Dinner. To book a this trip just drop us a call or email, our customer service department of dhow cruise dubai will get back to you with in no time, we work 7 days a week.